In 12-inch skillet, cook bacon over medium-high heat until almost crisp. Add beef, onion, bell pepper, garlic and salt; cook 5 to 7 minutes, stirring frequently, until beef is thoroughly cooked; drain. Stir in water, tomatoes, olives and Italian seasoning; heat to boiling. Stir in rice. Reduce heat to medium; cover and simmer about 5 minutes or until rice is tender. Sprinkle with cheese; cover and let stand until melted. 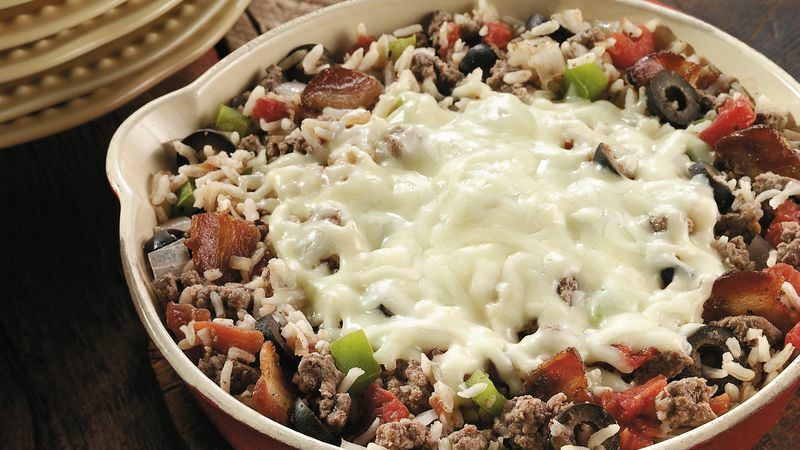 A few slices of bacon adds a nice smoky flavor to this easy one-dish beef and rice meal. In place of plain diced tomatoes, you can use Italian-style diced tomatoes, tomatoes with garlic or tomatoes with celery and green bell pepper. Chop some fresh herbs that you may have, such as parsley, basil or oregano, or a combination of herbs, and mix into the shredded mozzarella before sprinkling on top of the rice dish.